A few things to consider when choosing the size of your shoes. Ideally you would come into our Melbourne shop and try the shoes on and we could then help you make the right decision. This is the safest way to order our shoes as we make everything to order they cannot be returned if you’ve chosen the wrong fit. However if you can’t make it in then we have put together a description of all of our sizes. – Use the ‘how do i measure my size’ to determine what to look for when deciding on the type of shoe that will suit you, or to take measurements from scratch. – The size chart will help you convert from cm to our sizes or american to our sizes etc. However all of our lasts fit slightly differently so read the following section too. – ‘Our Lasts’ has a breakdown and description of how each of our lasts fit. 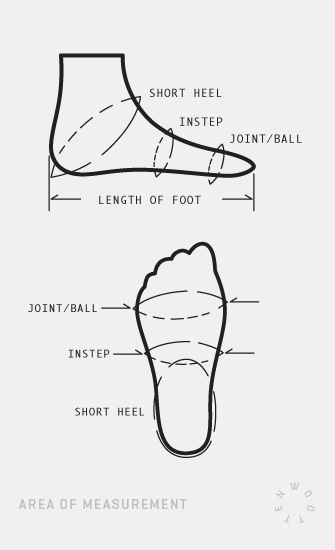 We recommend reading through this to help determine which shoe size and style would be best suited to your foot shape. finally the last four sections are considerations when determining how you are going to wear your shoes, these are all factors when determining the best fit for you. There are a few critical measurements that need to be considered when deciding the type of last that will suit you. – Short heel (or around your heel and ankle), Instep and ball measurements as well as the length of your foot from the back of your heel to the end of your longest toe. (see diagram below) the method required to take these measurements is outlined in the step by step guide below. – Pitch (this is the difference between the height of the shoe at the heel and the ball of the foot) – a consideration for people who have issues with pressure on their forefoot, the higher the heel the more pressure there. – Width at ball – Each last will fit slightly differently here, the measurements you take will indicate how your foot matches up with our lasts. – Height of arch/instep – A higher arch/instep will be better accommodated by a shoe with more adjustment over that area ie. a Derby will be better than an Oxford. Secondly: Place one foot at a time on the ruler with your heel against the wall. 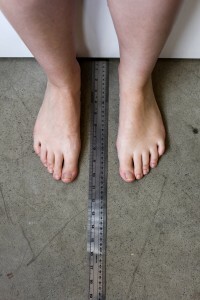 Place the longest part of your foot over the ruler measurement (this may not be you big toe). – Look straight down onto the ruler and note the measurement. Be sure to look down so you are seeing the measurements at right angle to the ruler, if your toes are up slightly off the ruler then the angle at which the measurement is viewed can change the measurement you record. – Also it is important that you are evenly bearing your wait on both feet, in a nicely rested and neutral position, dont put all of your wait on the one foot. repeat this for the other foot, note that they may be slightly different lengths (this is quite common). You will need a flexible tape (a dress makers tape, these are readily available from any supermarket, haberdashery store or even Ikea). wrap the tape around the back of your heel at the bottom to the front of your ankle at the top and record the measurement where the tape overlaps. it is important that the tape is neither too lose nor tight, you want it to be taught but not tight. Read the summary page if you are unsure of where this measurement should be taken and see below image for a reference. Take the flexible tape forward and wrap it around the high part of your arch/instep. This should be held at the same tension to the previous step. The final measurement is of the ball (joint) of your foot. This measurement is done across the widest point of your foot and should be on a slight angle (further forward on the big toe side than the little). It should be taken at the widest point of your first big toe joint and the widest point of your little toe joint. To access the sizing charts you may need to ‘Save the Link As’ on your computer. An elongated and tapered toe, each size in this last is 5-8mm longer than the Curby due to the narrower toe shape. A 20mm pitch and a reasonably generous fitting last for one that is tapered in appearance. However it is a slightly narrower fitting last than Curby. Very similar in fitting to the Paris. However with a 45mm pitch giving you a higher heel and suited to Cuban styles. An elegant almond toe last used for our Betty, Alvira and Vilma boots. Available in half sizes from 5.5-10. Has a heel pitch of about 55mm. A ‘d’ fitting last with a classic boot shaped toe. Again an anatomically designed form with an asymmetrical cone and footbed. A fairly neutral fitting last but we do find customers tend to be half a size down on this last compared to the Ladies Cambridge, which this last is modelled from. Used for our Alice, Bobette and Charlie boots. A lightly tapered toe and a very flat last with 10mm pitch. Designed for court shoes and low cut slip ons the short heel meaurement is slightly misleading. When fitting this last the key dimensions are length and ball girth. A reasonably generous fitting last for this style. When measuring for court shoes (or birdwood sandals) it is important that the last is a snug fit as there is little else than the firmness of the fit to keep the shoes on your feet. A ‘d’ fitting last and the narrowest of our mens lasts. A chiseled toe and an anatomically designed form. If you have a broader foot but would still like to wear this last then perhaps consider increasing your size by half a size from your fitting in the Cambridge or Uncle Tony. A ‘g’ fitting very tapered last. The combination of the broader fitting and the tapered toe means that for a pointed toe last this one has very generous proportions. People that fit our cambridge last will fit the Uncle Tony well also. The toe is biased to your big toe so shouldn’t cause discomfort to anyone except for those that have very broad or splayed toes. An ‘e’ fitting last with a classic boot shaped toe. Again an anatomically designed form with an asymmetrical cone and footbed. A fairly neutral fitting last but we do find customers tend to be half a size down on this last compared to the Cambridge, which this last is modelled from. Used for our Banjo, Bob and Gordon boots. A custom last option for men with a very similar fitting to our Cambridge but slightly more generous, with a broader and more rounded toe. What sort of socks will you be wearing with them? The thickness of your sock can vary the fitting of your shoes up to a half size. If you are trying them on with a business sock but intend to wear a padded sock or explorer style sock with them then you may need to increase the size by a half size. The larger the fitting of the shoe at the toes or the forefoot generally the more comfortable the shoe, however this will affect the aesthetics of the shoe. When considering a bike shoe for instance you want them to be firmer fitting and shorter in the toe box as they will be more efficient at transferring power. Where as if you are looking for a shoe for business then an elongated toe wont effect the performance of the shoe. What style of shoes are they? If they are lace ups then they can be slightly looser than if they are slip-on’s. so if you are after an every day shoe then we would always recommend a shoe with some sort of adjustment (laces or a strap and buckle) as this will allow for slight variations in the size of your feet during the day without becoming uncomfortable. If you fly a lot then this is especially important. What shape/sort of foot do I have? If you have a high instep then a derby construction will typically be better for you than an oxford. A broader toe will suit a broader foot and a higher cut topline will suit a narrow ankle.